Crispy potato chips is an all-time favorite snack of both adults & kids alike. Making at home is very simple and tastes divine & fresh so much better that the store bought ones. It makes a popular party snacks for kids, also a healthy appetizer or as a side dish. This delicious crunchy chips can be stored in air tight container or plastic bags for longer shelf life. Check out this easy video recipe to prepare potato chips at home! Wash and peel off the skin of potatoes. Keep water in a bowl to add the sliced potatoes. Now slice the pototo to thin rounds as shown in video. Add the slices immediately to water in bowl. Let the slices soak for 30 mins. Drain water completely and arrange the potato slices in a kitchen towel or any cotton cloth. Let it dry for 30 mins. Add the potato slices and deep fry in medium flame. Add the slices in batches and take care not to over crowd the oil. Once the chips turn crispy & golden, drain from oil in kitchen tissue to remove excess oil. When the chips are hot, sprinkle salt and red chilli pwd. 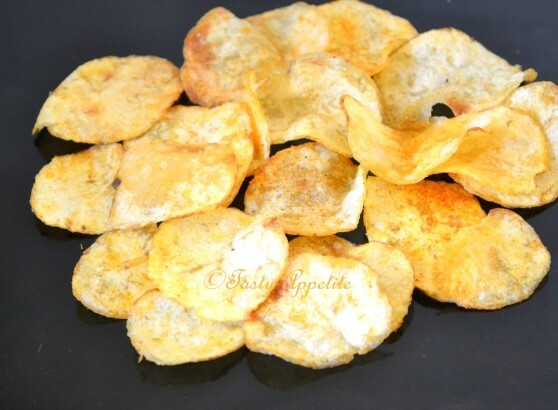 Super crispy and spicy homemade potato chips is ready. Enjoy with garma garam coffee/ tea.